I had the good fortune to meet Dinh Chau-Kieckhafer, the founder of a US-based arts non-profit called Think&Wonder, this past summer. Her organization emphasizes collaboration and cultural exchange, and thanks to her work, Third Space Tokyo has been connected to a high school animation class in Nevada. 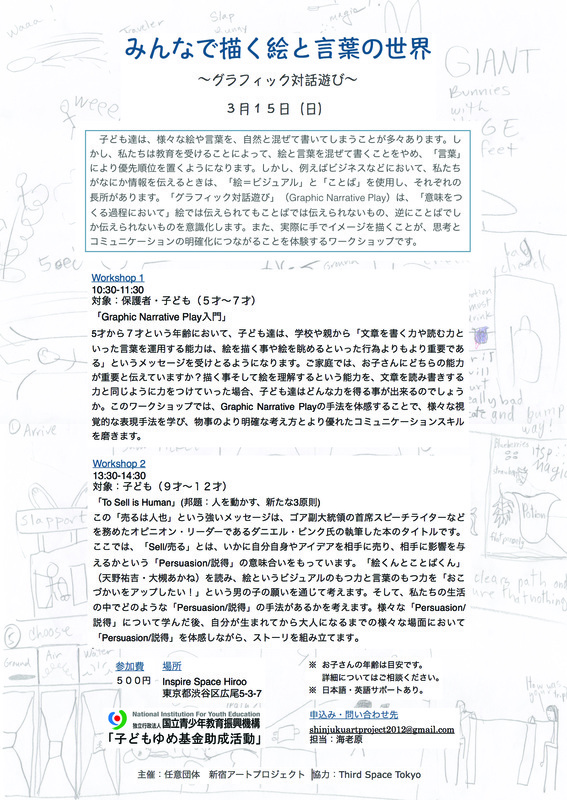 Participants in the Story Making 5-class series (our "Japan team") are currently preparing characters, settings, and plots to submit to the "US team" by the end of November. This is a challenge and rare opportunity for a small group of 8-12 year olds in Tokyo! We look forward to "meeting" the US team through video chat as the collaboration continues. Graphic Narrative Play at Hana House has shifted toward drawing based story making! Producing mini books and presenting them at the end gives us a goal that was lacking in the more open-ended "draw on roll paper" approach that I started with. One-time participation is allowed and can be fun, but the real gains come with ongoing attendance. Children who come each month are showing more confidence in story creation and are more willing to present their stories to the group at the end. Especially if your children are at a school where creative writing is not part of the curriculum, please join us! November 22 (Sunday) 9:30-11:00 a.m.
December 13 (Sunday) 9:30-11:00 a.m.
From January 2016, classes are set to be on the third Sunday of every month, 9:30-11:00 a.m.
​Please use the contact page of this website to register in advance. Details about the location of Hana House, cost, etc., are available here. "Story Making" classes start next Saturday! 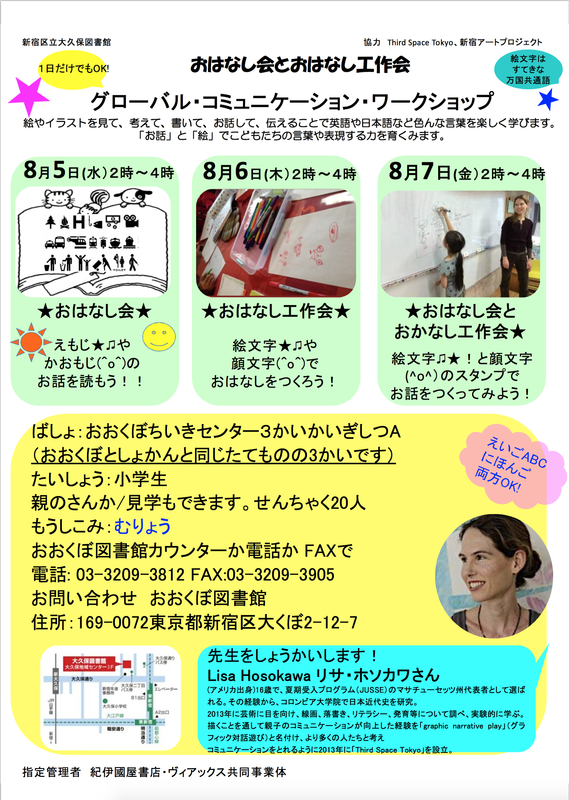 Next week, August 5-7 (Wed-Fri), I will be leading workshops at Okubo Library in Shinjuku-ku. Thanks to library generosity, these workshops are FREE. Okubo is a multi-cultural, multi-lingual area of Tokyo, and I expect that we will be mixing spoken languages as we create visual stories. For elementary school age children (age 6-12). Advance registration is required. 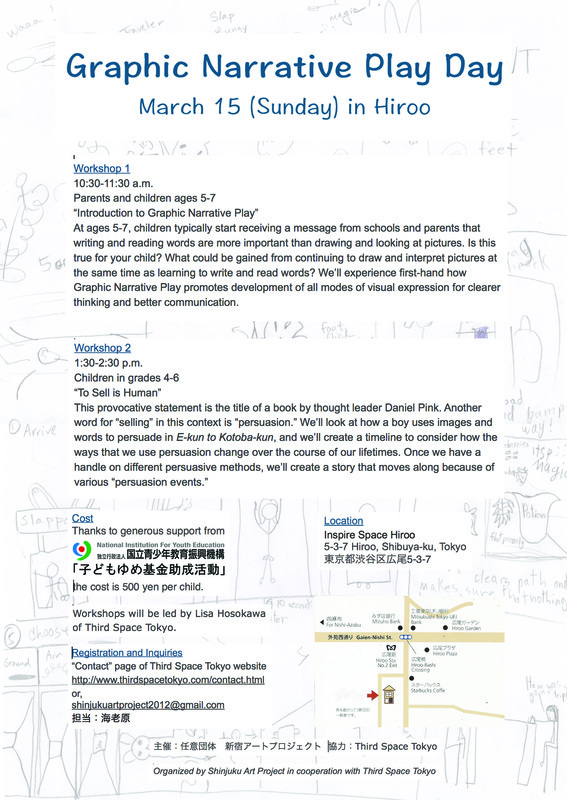 Please use the Third Space Tokyo contact page for inquiries in English. 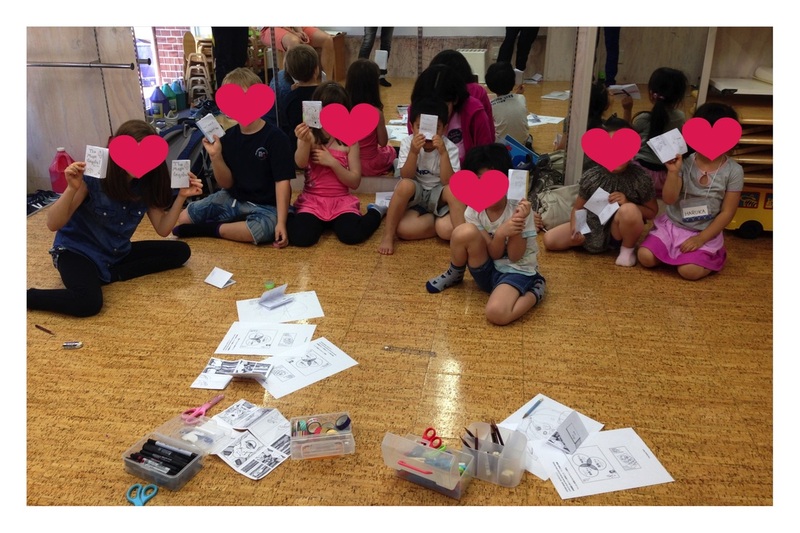 Graphic Narrative Play workshops at Hana House will continue through the summer! June 14th (Sun), 9:30 - 11:00 a.m.
July 26th (Sun), 9:30 - 11:00 a.m.
Aug 30th (Sun), 9:30 - 11:00 a.m.
A parent stays to learn about graphic narrative play and to participate. 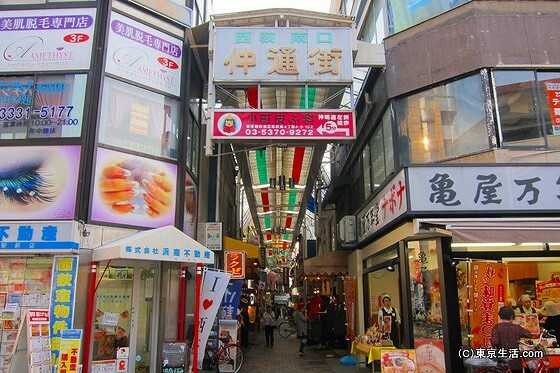 The easiest walking path from the station is through the 仲通街 (Naka Doori Gai) covered shopping street. 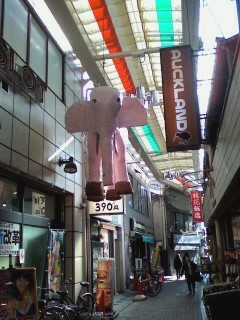 If you pass by a hanging pink elephant, you are going the right way! The next Graphic Narrative Play workshop at Hana House will be on May 17, Sunday, 9:30 - 11:00. 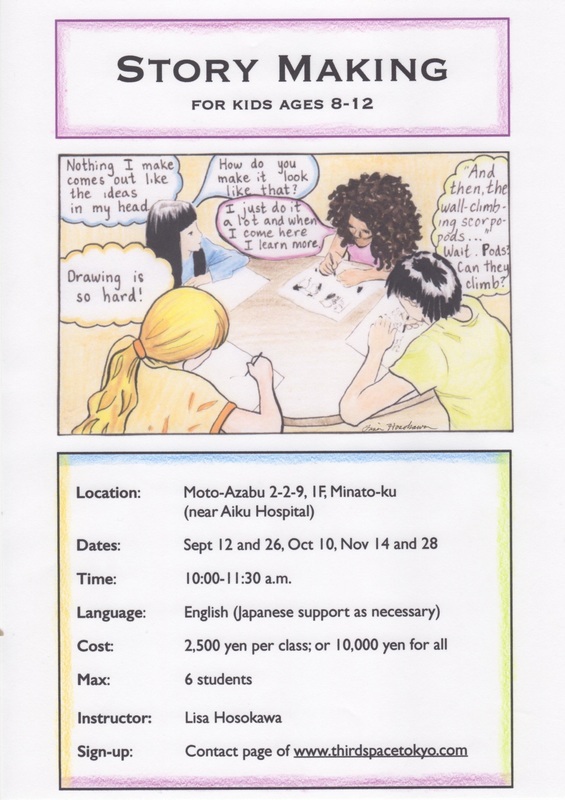 Please register in advance through the Contact page or by emailing Shuko Ebihara at shinjukuartproject2012@gmail.com .